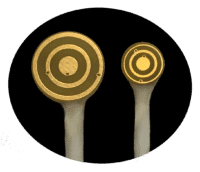 The outer ring and the center disc are used for delivering focal stimulation. Outer ring diameter =10mm or 6mm. Custom size may be available upon request. Cable length up to 6 ft. Custom length may be available upon request. 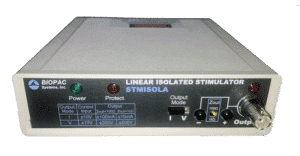 BIOPAC’s STMISOLA Constant Current and Constant Voltage Isolated Linear Stimulator is used with the MP36R System to output either voltage or current waveforms and provides considerable flexibility in stimulation protocols. Linear stimulator— Typically, stimulators can only generate simple unipolar or bipolar pulses. The STMISOLA, however, can output unipolar or bipolar arbitrary waves such as pulse (single or train), square, sine, triangle, exponentially decaying, modulated envelopes, and fully user-specified types. Voltage and current stimulator (unipolar or bipolar)—Voltage mode multiplies the input voltage x20, output Current mode has two options: High current (gain factor of 10 ma/volt) or Low Current (gain factor of 1 ma/volt); Low current mode permits much improved control for currents less than 10 ma. BIOPAC’s MP36R Research System is a flexible, powerful tool for life science research and teaching. 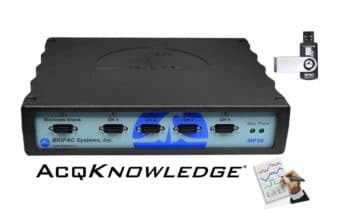 MP36R starter systems include an MP36R data acquisition unit, current AcqKnowledge 5 software, USB cable, power supply with US or Euro cord (based on delivery), and digital guides to get you started. MP36R Data Acquisition Hardware – The four-channel MP36R Research System is a data acquisition system with built-in universal amplifiers that can record a wide range of physiological signals. AcqKnowledge Acquisition & Analysis Software – AcqKnowledge is an interactive, intuitive program that lets you instantly view, measure, analyze, and transform data. Perform complex data acquisition, stimulation, triggering and automated analysis routines using simple pull-down menus and dialogs—no need to learn a programming language or new protocol. FOR RESEARCH PURPOSES ONLY. NOT INTENDED FOR MEDICAL USE. Just let us know what you need and we will prepare a quote.